Eden Prairie doesn’t make many forays into the eastern portion of the metro area. For the Eagles, rinks east of the Mississippi River might just as well be in Uzbekistan. Let’s just say Eden Prairie’s bus driver had a bit of a problem finding Aldrich Arena on Thursday, Jan. 6, en route to one of the most anticipated games of the season. With their bus still spinning its wheels, the Eagles unloaded their gear, slung their hockey bags over their shoulders and hiked up White Bear Avenue to the arena. Just as unusual as Eden Prairie’s arrival was the game’s tight-checking, low-scoring, make-one-mistake-and-you're-finished theme. That hasn’t been the Eagles’ style this season. 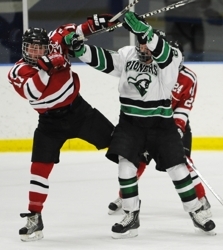 Run-and-gun Eden Prairie (9-2-0) had scored 18 goals in its previous three games en route to the St. Louis Park Holiday Classic title. Earlier in the season, the Eagles had a stretch of five games in which they scored a combined 37 goals. 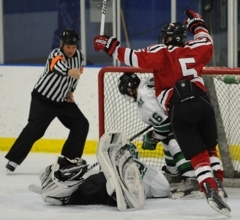 Goals don’t often come in bunches against defense-first Hill-Murray (7-3-1), a team that was coming off an impressive run to the championship of the high-powered Schwan Cup Gold Division tournament. 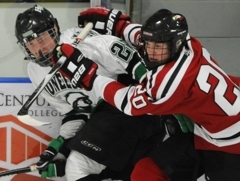 With bodies banging off each other and the boards like a pinballs in a machine gone haywire, and goaltenders Andrew Ford (Eden Prairie) and Tim Shaughnessy (Hill-Murray) in lockdown mode, the game was more of a grinder’s delight than sniper’s showcase. Gerdes said the pace of the game and the atmosphere surrounding it reminded him of a state tournament game. In particular, he said it was reminiscent of the Eagles' 2009 quarterfinal game against Hill-Murray that was decided in overtime. "It was just like a state tournament game," Gerdes said. "It seemed like when we were playing them two years ago in the state tournament. It was unbelievable it was so fast." 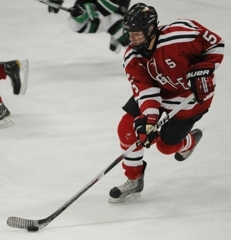 Gerdes’ emergence as a go-to guy around the net is one of the reasons Eden Prairie has a hammer grip on the state’s top ranking. With a team-leading 27 points, Kyle Rau, the Eagles’ leading scorer, has been his usual dominant self this season. 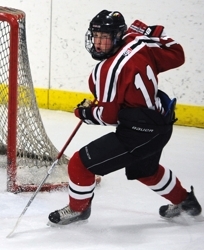 Gerdes, meanwhile, has 10 goals and 10 assists, giving Eden Prairie some additional scoring pop. “He worked so hard in the offseason to get stronger and quicker,” Smith said about Gerdes, who had nine goals in 28 games last season. “He’s always had great hands, and now he’s playing even with a little more power. It’s really paying off for him." Gerdes' winning goal did, indeed, come on a "power" move as he took the puck from behind the net, plowed his way to the front then reached around Hill-Murray goaltender Tim Shaughnessy before slamming the puck home. 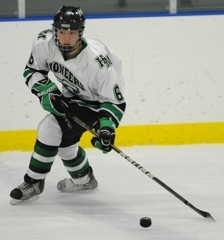 "There were moments that they kind of took it to us a little bit, but then there were moments that we created opportunities with some 2-on-1s, 3-on-1s," Hill-Murray coach Bill Lechner said. "They obviously finished on their second goal. We didn’t finish." 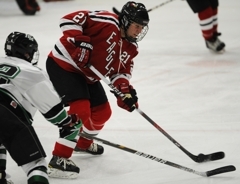 After missing three games with a nasty gash on his ankle, Eden Prairie standout senior defenseman Nick Seeler was back in the Eagles’ lineup against Hill-Murray. Seeler suffered the injury playing, of all things, boot hockey. 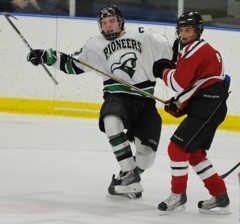 “Boot hockey in my backyard,” Eden Prairie senior forward Luc Gerdes said. “The goalies was wearing skates, and he stepped on Seeler and cut his ankle. It was just a little bit of bad luck. Seeler was paired with fellow senior Curt Rau for most of the game and he showed little rust in effectively shutting down Hill-Murray’s forwards for most of the night. “In a game like this, we needed him back on the ice,” Gerdes said. 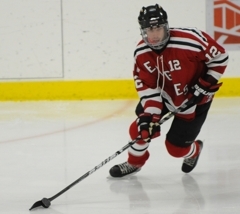 Senior Luc Gerdes scored midway through the third period to propel Eden Prairie past Hill-Murray 2-1 in a matchup of two of the state’s hottest big-school teams on Thursday, Jan. 6, at Aldrich Arena in Maplewood. 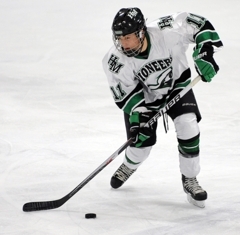 Gerdes’ goal came 1 minute, 52 seconds after Hill-Murray sophomore Jake Guentzel had tied the score at 1 with a rebound goal. 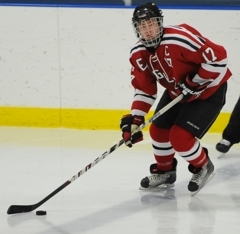 Eden Prairie, ranked No. 1, and No. 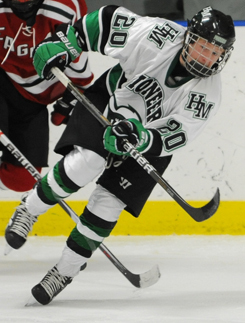 5 Hill-Murray each were coming off holiday tournament championships. The Eagles (9-2-0) won three straight to capture the St. Louis Park Holiday Classic title while the Pioneers (7-3-1) won three straight to take the championship of the Schwan Cup Gold Division. 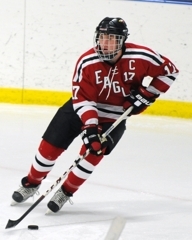 After a scoreless first period, the Eagles' Kyle Rau had the only goal of the second. 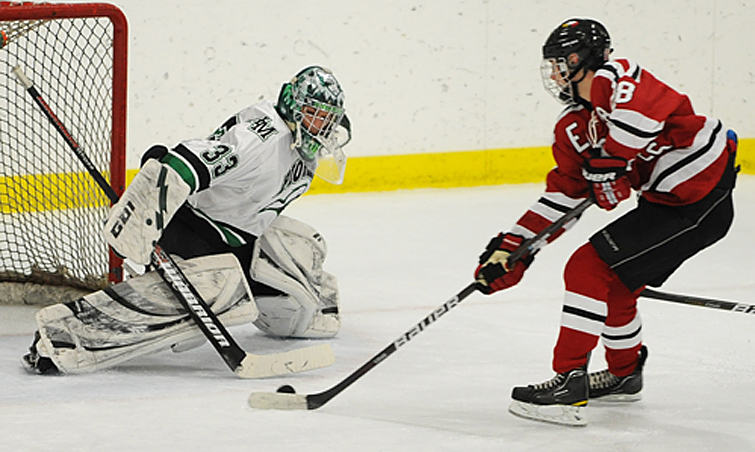 Both teams had numerous scoring chances in the second period, when Eden Prairie senior Andrew Ford and Hill-Murray senior Tim Shaughnessy made their toughest saves. Ford finished with 26 saves while Shaughnessy had 31. 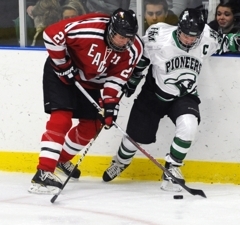 Eden Prairie won the state Class 2A title in 2009, a year after Hill-Murray won the big-school championship. 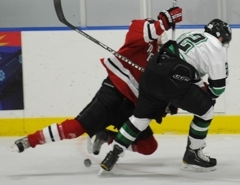 The senior forward scored the winner on a slick move to the front of the net, as he showed great patiency while waiting for Hill-Murray goaltender Tim Shaughnessy to go down before shooting. Gerdes’ goal, his 10th of the season, came 7:14 into the final period and less than two minutes after the Pioneers had tied the score at 1. 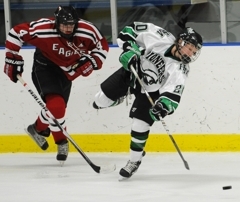 The Eagles senior scored in the second period, when he put on a dominating display of stickhandling and one-on-one mastery of several Hill-Murray defensemen. Rau also was effective on face-offs, winning the majority in the crucial closing minutes. 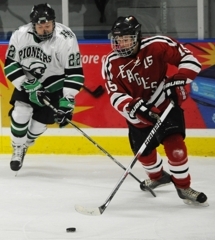 The sophomore scored a third-period goal and just missed on several other opportunities. 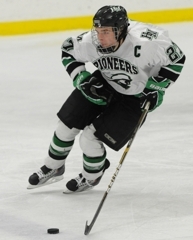 He was a big part of a line (Bobby Bruski and Luke Voltin also had numerous scoring chances) that was the Pioneers’ most consistent all night.